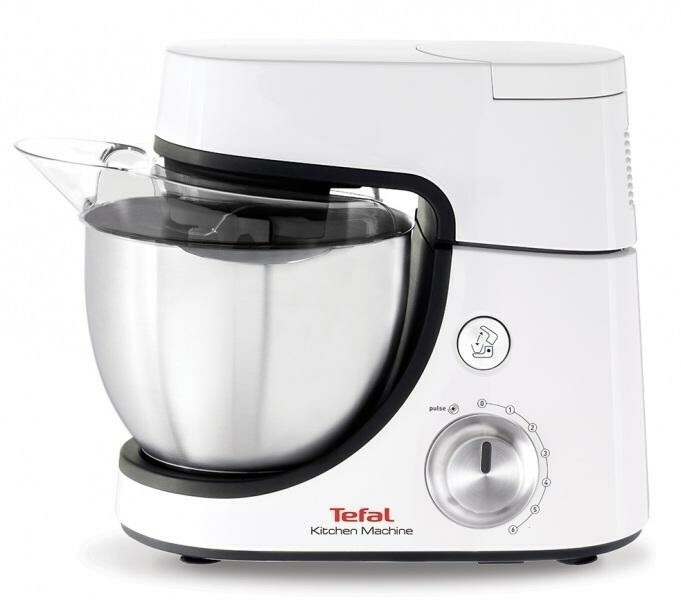 The Tefal QB502140 Kitchen Machine 4.6 Litre Bowl 900W is the perfect kitchen accessory for people who love to create home-made dishes and desserts. The planetary movement ensures that the whole bowl gets an even mix by not only rotating the mixer head but also rotates the mixing accessory simultaneously, there are several mixing accessories with this mixer including a die cast beater, an S shaped dough hook and a metal multi-wire whisk. The large 4.6 litre stainless steel bowl ensures that you can make enough mix for the entire family while the 1.5 litre blender enables you to make delicious soups and smoothies to go with your meal. There are 6 varying speeds on the mixer which ensure that you are always in control and also give you more power for when you have tougher ingredients.